Sterling Silver Interlocking Clasps--Interlocking Clasp is one kind of the jewelry clasps which plays an important role in jewelry making. We supply a series of top quality sterling silver interlocking clasps. 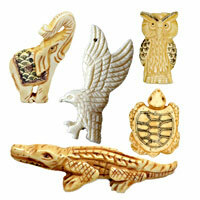 They are easy-to-use and versatile to fasten your jewelry pieces. More styles will be displayed soon. Add some high-end focal point to your designs with these brilliant sterling silver interlocking clasps. NOTE: Our Min. order is for each color each size. China beads accept OEM/special orders. Contact us now!